After Professional Mexican Saltillo Tile Cleaning Refinishing & Restoration of a kitchen floor in San Diego Ca. We stripped off and removed the old sealer, then deep cleaning the saltillo tile pavers and sealing the tiles & grout 5-6 times for maximum protection. Our mission is to service San Diego areas with Superior Saltillo Tile Restoration Refinishing Cleaning & Sealing by a licensed tile contractor who specializes in Mexican Saltillo tile Paver flooring patios steps staircases. WE INSTALLED THE SALTILLO TILES BUT IT RAINED BEFORE WE COULD GROUT THE TILES SO THE WATER COLLECTED UNDER THE TILES AND IN THE GROUT JOINTS LEAVING THE WHITE RESIDUE AND EFFLORESCENCE. SO WE REMOVED THE WHITE RESIDUE, THE CLEANING THE TILES BEFORE WE STAINED AND GROUTED THE TILES. STARTING THE STAINING PROCESS FOR THE SALTILLO TILES FOR THE PATIO TO A RICHER COLOR TO GIVE THE TILES A LEATHERY ANTIQUE LOOK FOR A PATIO IN SAN DIEGO. Saltillo Tiles are great for staining because the tiles are so porous that they really accept the stain well. BEFORE PICTURE of a brick wall, flagstone paver floors, and Travertine tile fountain that was not sealed properly so there is alot of hard water calcium build up and white efflorescence in the areas with a lot of exposure to the overflow water from the fountain. So we removed all of the white build up and then deep cleaned and sealed the masonry 3 times. AFTER PICTURE OF STRIPPED, CLEANED, AND RESEALED STEPS OF TECATE PAVERS & BRICK WALL LEADING TO THE POOL. WE USED A MATTE SEALER FOR THE OUTSIDE TILES. THIS RESTORATION JOB LITERALLY CHANGED THE WHOLE LOOK OF THE OWNER'S HOME IN SAN DIEGO. BEFORE PICTURE OF TECATE PAVERS THAT HAD COATS OF SEALER, LACQUER, AND EVEN STAINING ISSUES. I EVEN HAD MY DOUBTS ON HOW WELL IT WOULD TURN OUT. WE MADE THE FRONT ENTRANCE PATIO A HIGHLIGHT OF THE HOUSE. STRIPPING OFF THE OLD SEALER FROM THE TECATE PAVERS & BRICK PLANTER, DEEP CLEANING & RESEALING THE PATIO IN SAN DIEGO. SOME PEOPLE MISTAKE TECATE PAVERS FOR LINCOLN PAVERS. A BEFORE PICTURE OF A PATIO REMODEL WHERE WE REMOVED THE WHITE EFFLORESCENCE STREAKS FROM THE BEIGE ADOBE BRICK WALL CAUSED BY WATER DAMAGED & LIME & CALCIUM BUILD UP & DEPOSITS. AND SEALED THE ADOBE BRICKS TO HELP PREVENT THE PROBLEM IN THE FUTURE. AND WE TORE OUT THE OLD WOOD & CONCRETE DECKING, INSTALLED NEW CONCRETE & A CRACK ISOLATION MEMBRANE. AND THEN THE INSTALLATION OF A NEW BRICK PATIO IN SAN DIEGO CA. AFTER REMOVING THE WHITE EFFLORESCENCE STREAKS ON THE BRICK WALL & SEALING THE BRICKS AND INSTALLING A MULTI COLORED & MULTI PATTERENED BRICK BRICK PAVER PATIO. WE SEALED THE BRICKS WITH A SPECIAL SEALER TO BRING OUT THE COLORS OF THE BRICKS IN SAN DIEGO. THE BLACK ACCENT WAVY STRIP IS TO DELINEATE A SMALL STEP. BEFORE PICTURE THIS PROJECT WAS IN BEVERLY HILLS AND THEY HAD JUST RESEALED THE TILES OVER THE YEARS AND INSTEAD OF DOING THE PROPER PREP WORK, THEY JUST KEPT SEALING IN DIRT & OILS FROM THE OUTDOOR ENVIROMENT. THE TILE WAS INSTALLED 5 YEARS AGO. DURING THE PROCESS OF STRIPPING OFF ALL OF THE OLD DIRTY LAYERS OF SEALER. YOU CAN SEE THE CLEANED TILES TO THE UPPER LEFT OF THE PHOTO. AND ALL OF THE DIRT & FILTH CAUGHT IN THE SEALER THAT HAS BEEN REMOVED. San Diego AFTER STRIPPING, CLEANING, & RESEALING SALTILLO MEXICAN PAVERS WITH A LOW GLOSS FINISH. To Maintain the Saltillo tile floors it is a good idea to have them cleaned and resealed every 3-4 years so they don't get to the point where any stripping off of old sealers is needed. BEFORE PHOTO OF DIRTY TRAVERTINE TILES. YOU CAN SEE WHERE THE CLEAN TILES WHICH WERE UNDERNEATH THE CARPET OUTLINED BY ALL OF THE DIRTY TILES. ALOT OF IT IS HOUSECLEANERS JUST WIPE AROUND DIRTY WATER & SINKS INTO THE PORES OF THE STONE & GROUT. OVER THE COURSE OF 2-3 YEARS OF THIS BEING DONE WEEKLY YOUR FLOOR IS GOING TO LOOK LIKE THE ONE ABOVE. AFTER DEEP CLEANING THE TRAVERTINE TILES & GROUT TO BRING OUT THE NATURAL TONES OF THE TRAVERTINE TILE FLOOR TO BRIGHTEN UP THE SURROUNDINGS. EVEN THE DOG APPROVED OF IT. EXPERIENCED TRAVERTINE TILE FLOORS & SHOWERS CLEANING STAIN REMOVAL & RESEALING IN SAN DIEGO POWAY AREA. BEFORE PICTURE.... The customer asked that we strip, clean, and reseal the Saltillo tiles with a high gloss finish. AFTER PICTURE of Saltillo tiles sealed with a high gloss finish. BEFORE PICTURE of Flagstone Pavers & Brick Jacuzzi with grout haze & Faded Sealer. And white efflouressence residue on the precast concrete coping. BEFORE PICTURE of old and dirty Saltillo Tiles with a wood border that also needed to be stripped, really deep cleaned, and resealed. And the tiles came out alot better than I was hoping. BEFORE PICTURE of really old and dirty Saltillo tiles. The owner moved their cabinets, so we had to strip, clean, and seal the existing tile. And then match and install new Saltillo tiles as well as doing a good job of matching the grout color. AFTER installing, refinishing, and staining the Mexican Saltillo tile pavers to match the existing tiles after being stripped, cleaned,and sealed. BEOFRE PICTURE. THIS JOB TOOK ALOT OF SKILL & WORK TO GET RIGHT. THE COLORING IN THE ARTO CONCRETE TILES HAD FADED FROM EXPOSURE TO THE SUN & ELEMENTS AND SOMEONE ELSE HAD APPLIED A TOPICAL SEALER THAT WAS FADING & PEELING IN SOME AREAS. SO WE STRIPPED OFF ALL OF THE TOPICAL SEALER (YOU CAN SEE SOME WE STILL HAD TO REMOVE BY THE CORRIDOR), THEN WE DEEP CLEANED THE TILES & GROUT. WE THEN MATCHED THE COLORS OF THE FADED TILES TO THE COLORS OF THE TILES WHICH WERE UNDER THE PATIO ROOFING AND NOT EXPOSED TO THE SUN. AND WE THEN SEALED THE TILES AND GROUT WITH 5 COATS OF A GLOSSY SEALER TO TOTALLY CHANGE THE ENTRY TO THE CLIENT'S HOME. A PICTURE DURING THE PROCESS OF STRIPPING OFF OF A FAILED & "CLOUDY" SEALER AND DEEP CLEANING THE BRICK PATIO FLOORING. BEFORE PICTURE OF SALTILLO TILE. AFTER WE STRIPPED THE PAVERS, CLEANED THEM, AND RESEALED THE TILE FOR A DRAMATIC DIFFERENCE. UNFORTUNATELY THE TILE AND GROUT WERE NOT SEALED PROPERLY DURING INSTALLATION BY ANOTHER TILE COMPANY SO THERE ARE SOME STAINS THAT WERE ALREADY EMBEDDED INTO THE TILE AND GROUT. BUT IT STILL MADE A WORLD OF DIFFERENCE. 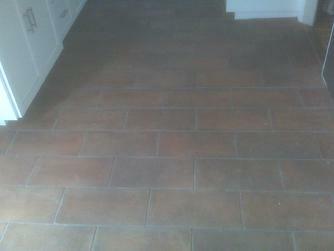 BEFORE PICTURE OF SLATE TILE CLEANING & RESEALING PROJECT. YOU CAN SEE THE CARPET OUTLINE OF WHERE THE SEALER HAS START TO FAIL & THEY HAVE WATER SPOTS FROM THE CONCRETE UNDERNEATH IN OTHER PLACES. Properly staining, sealing, and installing Saltillo Terra Cotta Tile flooring for a patio in San Diego. We also formed and installed the precast concrete bench caps for the seating area. BEFORE PICTURE of dirty Saltillo tiles with an old and faded sealer. DURING THE CLEANING OF THE SALTILLO TILES AND GROUT JOINTS. GETTING READY FOR THE APPLICATION OF THE SEALER AND POLISH TO BE APPLIED. AFTER SEALING THE SALTILLO TILES AND APPLYING A LIGHT ACRYLIC POLISH FINISH. ALSO, NOTICE THE CONSISTENCY OF THE GROUT COLOR AFTER AND HOW CLEAN WE ALSO GET THE GROUT. AFTER WE STRIPPED,CLEANED, AND RESEALED THE SALTILLO TILE. IN THE PREVIOUS PICTURE YOU CAN SEE THE DOWN THE HALL AND THE ROOM ON THE LEFT IS WHAT YOU ARE LOOKING AT NOW ALL BUTTERED UP. BEFORE PICTURE of Stamped concrete SEALED WITH THE WRONG KIND OF SEALER. AND IT TURNED WHITE AFTER IT WAS EXPOSED TO THE ELEMENTS. AFTER STRIPPING OFF THE OLD SEALER, CLEANING THE STAMPED CONCRETE, AND RESEALING THE CONCRETE. BEFORE picture of dirty Mexican Terra Cotta Pavers.The old sealer had worn off. AFTER picture of the Mexican Pavers being stripped,cleaned, and resealed. BEFORE PICTURE of dirty tile and grout outlining the carpet area. BEFORE PICTURE. Dirty Saltillo Tile Floor. The white wash has faded & the sealer has turned a yellowish color. You can see our sample at the middle of the floor. The homeowner actually asked it to be not so white as you can tell in the photo below. We had to strip off all of the old & failed sealer, deep clean the tiles, white wash the tiles, and then seal with a medium gloss sealer. AFTER STRIPPING, CLEANING, WHITEWASHING, & RESEALING MEXICAN SALTILLO TILE FLOOR. PROFESSIONAL WHITE WASHED SALTILLO PAVERS STAINING PRESEALING, SEALING & REFINISHING IN SAN DIEGO AREAS. Resealing of Saltillo Pavers that I installed. With a matte finish for more of an earthy look. One and a half years after the installation and still looking good. BEFORE PICTURE.... of dirty limestone tile and grout that has lost its lustre. This was a tricky job. We had to tear out saltillo tile and concrete for a new garden area and we had to replace some water damaged Saltillo tiles. Then strip, clean, and reseal the old Saltillo and stain the new Saltillo tile to match the original tiles. And come up with a nice terra cotta accent strip to match the newly installed entrance terra cotta steps in the picture below. ANTIQUE STAINED SALTILLO TILE PAVER PATIO DECK FLOORING WITH A SUPER HIGH GLOSS POLISH OUTDOORS IN SAN DIEGO. San Diego refinishing and restoration (stripping, cleaning, and resealing) of Saltillo tile pavers, Mexican Pavers flagstone pavers, slate, quartzite, saltillo pavers, terra cotta, lincoln pavers, ceramic, and porcelain tile. We use Low VOC product s for the stripping and cleaning process which is where most of the labor is done. We first will strip all of the old sealers and dirt build up form the tile or stone, and then clean the tile or stone before the sealing process. For flagstone, slate, and saltillo restoring you do not want to do any sanding when you are working. It is all done by hand. And we make sure to tape off all baseboards and doors. And we can handle any moving of furniture or appliances. Feel free to give me a call and we can discuss your project and set up a time I can come out and give you a free sample of the finish product after the restoration. As well as take some measurements and give you an estimate. Working in San Diego and Orange Counties including Coronado, La Jolla, Del Mar, Encinitas, Rancho Santa Fe, Solana Beach, Carlsbad, La Costa, Leucadia, Oceanside, Vista, San Marcos, Escondido, Valley Center, Fallbrook, Temecula, Murrieta, Poway, Rancho Bernardo, Scripps Ranch, Ramona, Julian, Jamul, Santa Ysabel, Alpine, El Cajon, Palm Springs, Indio, Palm Desert, Chula Vista, Jamul, Cuyamaca, Dana Point, San Clemente, Laguna Beach, Laguna Niguel, Mission Viejo, San Juan Capistrano, Lake Forest, Aliso Viejo, Newport Beach, Catalina Island, Huntington Beach, Rancho Palos Verdes, Rolling Hills Estates, Beverly Hills, Santa Monica, Malibu, Hollywood, Bel Air, Santa Anita, Big Bear, Lake Arrowhead, Lake Tahoe Ca Santa Barbara Expert Resealing of MEXICAN SALTILLO TILES Coto de Caza Los Angeles Glendale Long Beach Santa Ana Tustin Palm Springs Coachella Valley Carmel California Monterey REFINISHING & CLEANING SALTILLO TILE FLOORS & OUTDOOR PATIOS BY A TRUSTED TILE RESTORATION CONTRACTOR. INSTALLATION,RESTORATION AND REFINISHING OF SALTILLO, FLAGSTONE, TERRA COTTA, QUARTZITE, AND LINCOLN PAVERS. AND SLATE, QUARTZITE, TRAVERTINE, GRANITE, MARBLE, CERAMIC, CONCRETE TILES AND PORCELAIN TILE. CLEANING & REFINISH SALTILLO & TECATE TILE PAVERS RESEALING-CLEAN-RESTORE INSIDE OR OUTSIDE TECATE PAVERS RESEALING. We also specialize in expert installation & applying non slip additives to slippery finishes which require a more gritty and anti skid coating for outdoor pool deck areas stair treads steps sidewalks showers for a slip resitant finish and skid safe application for interior and exterior bricks travertine tile pool tiles limestone Saltillo tiles & Mexican Pavers flagstone marble granite ceramic and porcelain tiles servicing San Diego areas.